In this interview, Engr Sunday Makinde FNSE, the immediate past National Chairman of Nigerian Institution of Electrical Electronics Engineering bare his mind to Isqil Najim on the progress of the Nigerian Society of Engineers and the ongoing plan to support the young engineers in the country. Isqil Najim;. My name is Isqil Najim, I am pleased to have this opportunity with you. To begin with, can we meet you sir? Engr. Makinde: I’m Engr. Adekunle Sunday Makinde, a Fellow of the Nigerian Society of Engineers, and the Immediate Past National Chairman of The Nigerian Institution of Electrical and Electronics Engineers. I studied Electrical and Electronics Engineering at the Federal University of Technology, Akure (FUTA), having earlier graduated from The Federal Polytechnic Ado Ekiti, in the same discipline. My foray into the Engineering Industry started back in the early 90s, working then as OEM’s installation and Operations & Maintenance expert. At the turn of the new millennium, I was one of the privileged “Young Engineers” to be employed by the First National Telecoms Carrier, NITEL, where I was trained on all parts of Telecoms Engineering, and practiced in several of such departments like the External Line Plant, Transmission, Switching, etc. Furthermore, I had the privilege of honing my technical, administrative and managerial skills as I was appointed to serve as Personal Assistant to some five (5) Territorial Managers. That was some experience! I later moved on to the Second National Carrier where I am in charge of Lagos Region regarding Project Planning, Execution, Operations & Maintenance. My fraternization with the Engineering family started while in the University, but developed after graduation, and later blossomed during my practice. I cut my fellowship teeth at the Lagos Branch of Nigerian Society of Engineers under the Chairmanship of Engr. Prof. Salawu (then a Dr). I was also with NSE Electrical Division which used to meet then at the popular 7 Ibikunle Street, Yaba, Lagos under the National Chairmanship of Engr. Michael Adegbite, FNSE of blessed. However, it was actually Engr. Dr. M. A. K. Adelabu, FNSE that “discovered” and really encouraged me to take up national office as an Executive Committee member. The rest is history, as I later rose through the ranks on the platform of record achievements and diligence, handling offices of Assistant General Secretary, General Secretary, National Vice Chairman and eventually, the National Chairmanship of The NIEEE, which I handed over last year 2014 having served for the statutory two (2) year term of 1 year per term, and after landmark and unprecedented achievements. To God alone be all the glory! Isqil Najim;.. You are the National Chairman of NIEEE, what is your assessment of the performance of the Divisions of NSE and how do you think the NSE can improve on their activities ? Engr. Makinde; Yes, as I earlier said, I was the National Chairman of The NIEEE from February 2012 to March 2014. Generally, the NSE Divisions seem to be doing well, especially in the recent past. But that could only be said about mostly about “the Big Ones”. Really, there is a lot of room for improvement. That is a gerund: it is work in progress. i. Firstly, I think that the Divisions can do much more in the areas of developing Codes and Standards for the various industries under their jurisdictions. A situation where anything goes as per quality really leaves so much to be desired. That is not what obtains in many places outside our shore. The NIEEE has actually been doing a lot in this regard in the recent past, and much is still in the offing. Ditto for quite a number of other Divisions. However, much better synergy with both NSE and COREN would make things work a lot better. ii. Secondly, the Nigerian University Commission (NUC), National Board for Technical Education (NBTE) and professional bodies such as Nigerian Society of Engineers (NSE), etc. should form a coalition with the Universities and Polytechnics in reviewing the Engineering curricula, to address societal needs and present day realities. iii. Institutions of higher learning and R&D Centres should be involved in commercialization and marketing of developed technologies, so as to promote and sustain the entrepreneurial mind-set. Lots of innovations and discoveries die naturally for the lack of these. iv. There is need for fostering functional linkages (mostly the consulting engineering process) between academia, professional bodies, regulatory bodies and the industry, in order to acquire and transfer technology for the support of critical sectors of Agriculture and Water Resources. v. I would also have loved a scenario whereby NSE and COREN embark on operational reforms, to promote Continuous Mandatory Professional Courses (CMPC) and Cumulative Credit Points (CCPs), thus allowing prospective Engineers gain admission into NSE from base Divisions, and eventual registration by COREN into different statutory categories. Though COREN has literally handed off the assessment process to NSE presently, thus allowing NSE to recommend to COREN, I feel that it should cascade downwards to the Divisions, being the original “primary constituencies” of the candidates. We are already on the way. We shall get there. Isqil Najim; looking at your own division can you say, the NIEEE has been living up to the billing as a Division of NSE? Engr. Makinde; Under my watch as the National Chairman of The NIEEE, FIVE (5) Chapters were inaugurated in Port Harcourt, Osogbo, Yenagoa, Enugu and Ibadan, by the grace of God. I must confess to you that that was unprecedented! No other Division has ever done that! And, you can see the spread around the country. Just in July 2015, yet another Chapter was inaugurated again, this time around in Asaba. Many more are still in the offing. That explains part of the growth and success stories of The NIEEE. Our International Conference and Exhibition on Power and Telecommunications (ICEPT) is already in the 11th edition, and this year’s is being hosted by our Osogbo Chapter from 12-16 October 2015. This is a programme designed to highlight the challenges that we are facing in these two (2) key areas of infrastructure as a nation, and proffer solutions to them, while the recommendations or communiques emanating therefrom are shared with policy makers in all strata of Government. Of course, because ICEPT is international in outlook, delegates from other parts of the world also attend, thus making room for robust deliberations and results. Our joy is that, some of these recommendations are being implemented by both the Federal and some State Governments. Workshops and Conferences and Lectures are also organized periodically by The NIEEE Chapters across the country, which are coordinated by the National Secretariat and are geared towards Professional Development and continuing education amongst members. One of the special events is the DEEEAL Lecture (Distinguished Electrical and Electronics Engineer Annual Lecture) which is usually delivered by a very Senior and accomplished Engineer who has distinguished him/herself in the discipline. So far, we have had twelve (12) lectures in the series. The Society has a Job Placement Unit, which maintains a list of members wishing to change jobs or in search of jobs, and this list is available to prospective employers. This does not exclude applicants who are considered for training as entrepreneurs (small business startups). The Institution publishes a Quarterly Journal “The ee+T”. It also publishes the Technical Transactions such as ICEPT Proceedings which is yet to be fully accepted by Universities, eNewsletter, and other ad-hoc publications. The NIEEE institutes Awards and Prizes for papers, researches and other contributions to the profession from time to time to members who have distinguished themselves in the profession. The Institution maintains a benevolent fund to which individual members contribute. The fund is to help members and their families in distress. This operates more at our various chapters all over the country, since they are closest to the members. During my stay at the helm of affairs as the National Chairman of The NIEEE, a Memorandum of Understanding was signed with IEEE Nigeria Section, which has enshrined a seamless collaborative effort. This has been yielding positive dividends. The NIEEE has an Engineering Library at her National Secretariat on Victoria Island, Lagos, which has been of immense benefit to her teeming membership. The e-library portal is under review. The Institution has a registered Limited Liability entity to engage in Consultancy Services and Professional Development of her members. Isqil Najim;.. You were recently appointed as the National Chairman of Young Engineers Development Committee by The NSE Council. Can you tell us what this committee is about and what motivated its establishment by the NSE President Ademola Isaac? Engr. Makinde The Young Engineers Development Committee (YEDC) is the supervising organ of the Young Engineers Forum of Nigeria (YEFoN). All the activities are still under YEFoN, but being driven by YEDC. Young Engineers Forum is NOT only associated with the Nigerian Society of Engineers. It is a GLOBAL concept that is practiced by member organizations of the World Federation of Engineering Organizations (WFEO). There is a Young Engineers Forum slot in the WFEO, thus making it a global practice. In the Nigerian Society of Engineers, YEFoN was inaugurated in 2010. The concept behind YEFoN is to mentor and guide the younger ones in the Engineering profession, who will eventually take over from the senior Engineers. Of course, I feel that this is only natural. My people have a saying: The local deity being worshipped without the younger ones would soon go into extinction. It is an endangered specie! So, in every setting, the younger ones are born and they should naturally be groomed to take over from the older ones. That is the only way that the profession can be sustained. Isqil Najim; one of the numerous complaints by most young engineers I interacted with, is that NSE has abandoned them and is not doing enough for them to develop into fully active engineers. Majority of them are angry. What is your view on this and what is NSE doing or plan to do to assist them? Engr. Makinde That assertion is really not correct. You see, you really can’t assert that a meal is either sour or delicious from a far distance. It is only when you taste it that you can tell. By the establishment and sustenance of YEFoN by the NSE Council, these complaints have been long addressed. Even before then, there were mechanisms in place to “sort out” the Young Engineers. There have always been. • Continuing Professional Development which will include training in technical and business skills. • Full and long term participation in Association of Consulting Engineers Nigeria (ACEN) and International Federation of Consulting Engineers (FIDIC) activities, especially during the annual conferences. • Networking among Engineers in the industry. • Access to a wide variety of online resources throughout the Engineering Industry worldwide. So, with the aforementioned in mind, it is eminently evident that those complaints are really unfounded. The young engineers that you interacted with and others who may be complaining are not really involved with YEFoN or NSE. NSE has a good place for young engineers. During NSE conferences, programmes are organized specifically for young engineers. NSE has sponsored young engineers to attend World Engineering conferences in different parts of the world, such as Kuwait, France, Singapore, etc. Young Engineers who don’t get involved in NSE activities most definitely won’t be aware of what has been happening and what has happened over time. All that I can do is to encourage them to get involved in NSE activities. There are NSE Branches across the country, they should get involved in the Branch that is in their resident city or closest to their resident cities. Isqil Najim;.. is COREN involved in this plan? For now, it is an NSE affair, though future collaborative efforts in the nearest future cannot be ruled out. 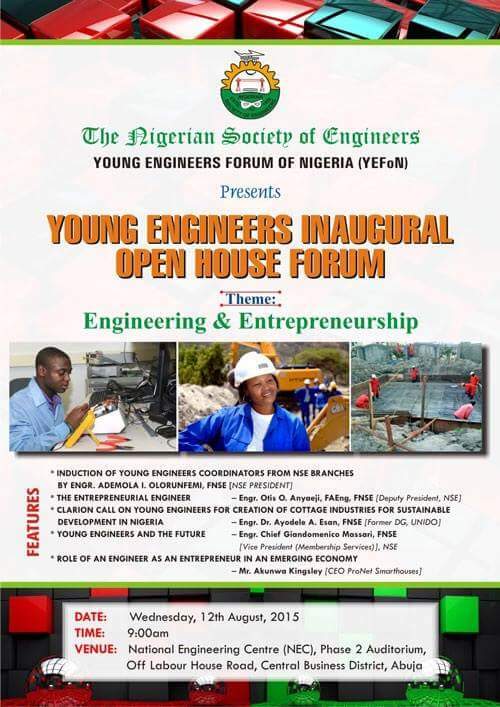 The forthcoming Young Engineers’ Inaugural Open House Forum is only planned to come up during the COREN Engineering Assembly so as to avoid extra transportation cost and travel risks that the Young Engineers would not be subjected to, if it were to hold later. Isqil Najim;.. On August 12, in Abuja the NSE would unveil the graduate forum coordinators nationwide, could you give us insight into their proposed operation and how NSE intends to evaluate the performance of the committee. ? Engr. Makinde The President of the Nigerian Society of Engineers, Engr. Ademola Isaac Olorunfemi, FNSE will be inducting the Young Engineers Coordinators from the various Branches of the Nigerian Society of Engineers. There is a Term of Reference which will guide their activities. In evaluating their performance, the coordinators will report to their Branch Executive Committees, while the Executive Committees through their Branch Chairmen are expected to report to the Nigerian Society of Engineers on their score card. The event on 12 August 2015 is carefully and specially designed for Young Engineers, to bring out the Entrepreneurs in them. Speakers are all established and accomplished Entrepreneurs themselves, and they would be opening up our eyes to the opportunities that abound in the Country. Isqil Najim;.. Many young engineers and practicing ones, in my conversation with them suggested that NSE should establish postgraduate training school similar to what lawyers (law schools) and doctors (teaching hospitals) have. What is your view on this and what would your suggestion to the president be. Engr. Makinde As I stated earlier, Young Engineers that are not involved in NSE activities will always raise issues that the NSE has been handling. These issues and some others are already being addressed by the NSE. There are instances of some Engineers that were employed in several locations and positions, totally oblivious of the fact that the engineering body actually went ahead to prepare the ground for their employment and position. I have several examples to buttress this. Unfortunately, even some that are aware completely refuse to associate with the Engineering body afterwards. Isqil Najim;.. Thank you for your time sir. on a parting note, the electrical division have been coming first in nse group dynamic for so long that it has forgotten how to come second until last year. what is the philosophy behind your division’s prolonged success at the top that is worth sharing with young engineers, to make them as steady on the top as the NIEEE? Engr. Makinde It is an open secret that we temporarily lend the first position and trophy to another Division, just to let them have a feel of it for a one-year term which is already elapsing, and so that we won’t be tagged as selfish. We’re now taking back what rightly belongs to us in Akure, Sunshine 2015. Part of the success secret of The NIEEE is in teamwork (majorly building on the solid foundation of our founding fathers), focus, dedication, hard-work (+smart-work), excellent and rancour-free succession plan, more importantly, faith in God, among others. Engr Makinde: You are welcome. Isqil is like a multitalent microchip. The people in mass communication would not have conducted a better interview. Thanks for the interview as important issues were raised and discussed. Looking forward to the next one.